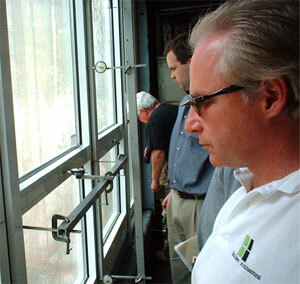 Mark Meshulam is an expert witness and consultant for aluminum window leaks. Aluminum can be extruded into almost any imaginable cross-section to achieve whatever structural and functional properties are required. Aluminum is non-porous and doesn’t rot under prolonged exposure to water. Even if the paint is scratched to bare metal, the aluminum will endure (it may not be pretty but it won’t “rot through” unless extreme conditions exist). By contrast, wood will turn into black mush unless kept dry. Aluminum can be finished in an infinite variety of colors and paint qualities, some of which are amazingly durable. Today’s article, however, is not to extol the many virtues of aluminum windows, but rather to discuss how they can fail. With windows, as in life, knowledge of failure can help to achieve success. This list is created from my experience alone. That experience consists of almost 30 years, overseeing the installation of literally millions of square feet of windows, witnessing over a hundred field tests and having spent almost a full year in testing laboratories. Enough with the credentials, let’s get going. High quality subsill (gutter) sealed to surrounding condition. Windows sit on this gutter. 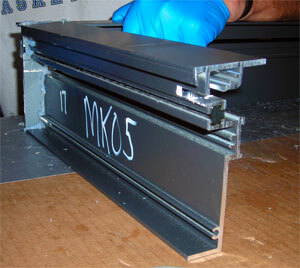 Most aluminum window systems have, or should have, some form of gutter system. A gutter system is essential to catch any water which might penetrate the system through frame joints, gasketed engagements such as at receptors or mullions, or even (depending on the design) minor sealant failures. A gutter system could be a continuous flashing under a “run” of windows, or a subsill which is capable of holding a large volume of water. In both cases, the gutter system must have a provision to allow water to drain to the exterior without also allowing the water to leak to the interior. There is quite a bit of physics involved in the design of subsills but we won’t go there today. Look for a future article, or search the web for “Rain Screen and Pressure Equalization Principle”. 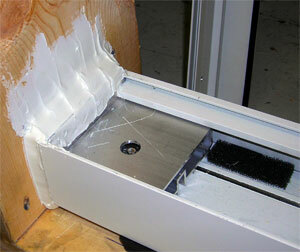 Holes or penetrations in the gutter system. Good rule of thumb: Avoid penetrating the gutter system, for instance, with a fastener in the wet area. Even if you seal the fastener hole, the sealant can later fail and the repair will be difficult because it will probably be inaccessible. 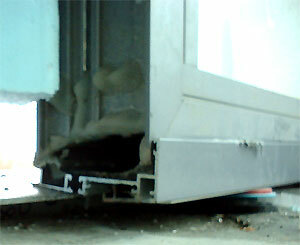 Leaks at splices in the gutter system. In long runs of windows, there will inevitably be multiple pieces of “gutter” which must be sealed to one another. These splices must be sealed with proper joint design, allowing all anticipated movements, and must be “married” to the surrounding perimeter caulk. Window sitting in subsill. Subsill must be properly terminated or water will leak into building. Architectural drawings and window shop drawings are loaded with “sectional details”, which are drawings of what you would see if you took a chain saw, sliced out a hunk of the building or window system, then looked at the end of the hunk. People afflicted with detailitis fail to look beyond the sectional detail. The sectional detail is a disembodied, two dimensional image which can never fully convey what happens to the pieces shown as they travel through space and terminate against something else. Only a 3-D (we call it an isometric) image can tell that story. 3-D drawings require more skill to draw, and therefore cost more, but a 3-D of a gutter termination is worth its weight in gold. A set of 3-D drawings is the best cure for detailitis. Isometric assembly detail showing sealant application. This is the right way to present critical areas. Gutters can terminate against jamb conditions which consist of multiple elements, such as a stud wall with sheathing, vapor barrier and other flashings. Architects must decide what part of the wall assembly constitutes the primary sealant plane, and make sure that the adjacent window system, and especially the gutter termination, marries to that plane. If it is not drawn in 3-D and clearly understood by all parties involved in the construction, you may have to get out the umbrellas. Leaks in end dams. Many subsill assemblied are terminated with an “end dam” which is typically a flat piece of metal sealed to the end of the gutter, often in the factory. Done well, a sealed end dam can do a great job of containing water within the system as well as providing a good area for sealing to adjacent substrates. The sealant connecting the end dam to the adjacent construction is called the “end wash”. End wash sealant must be tooled so that it will direct extraneous water into the gutter. Done poorly, however, a bad end dam or can be a big problem. This is why we recommend that a percentage of all subsills with end dams be “pond tested” during construction. Water head higher than gutter height. We haven’t yet delved into the mysteries of Rain Screen & Pressure Equalization, so I will just give this one a quick shot. Gutters are designed to accumulate and then “weep” water to the exterior. Depending upon the volume of water coming into the gutter, as well as the pressure difference between exterior and interior, varying levels of water can build up in the gutter. This water height, or head, can be actually calculated. If, under local weather conditions, wind pressures during a heavy rain cause the water head within the gutter to exceed the gutter’s interior height, get out the galoshes. More to come on this moist subject. Have a great week! Have leaks in your aluminum windows? The workmen carefully apply the peel and stick rubberized membrane to the top of the wall. This area is where the skylight will anchor.